This is the time of year when, frankly, every food-lover and cook is secretly squee-ing with joy. The farm markets are bursting with gorgeous fresh produce of every description, but it’s still early enough in the summer to enjoy everything. Still well before the excitement over produce gives way to exhaustion over having to deal with it all. (You know what I’m talking about, Person Who Has Spent All Hot August Day Canning Tomatoes While Staring At That Case Of Peaches That Still Needs To Be Dealt With. But right now is the sweet spot, and we are going to enjoy it for all it’s worth! Sadly, there are a few choice vegetables that get lost in the crush of baby lettuce and early tomatoes. One of these underdog vegetables is kohlrabi. 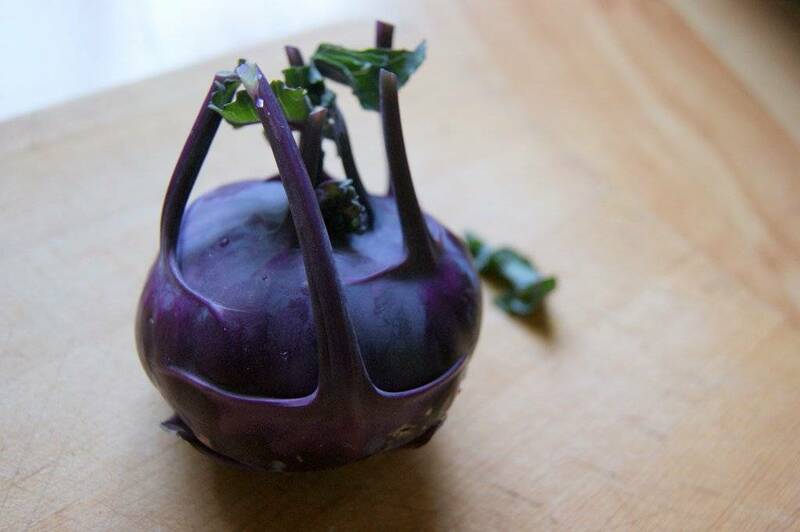 In the same humble family as cabbage and broccoli, but looking more like something Aunt Beru would cook with in a galaxy far far away, kohlrabi does not get the attention it so easily deserves. 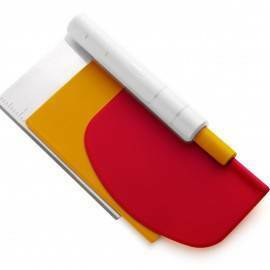 It’s cool-looking, easy to use, and very delicious. 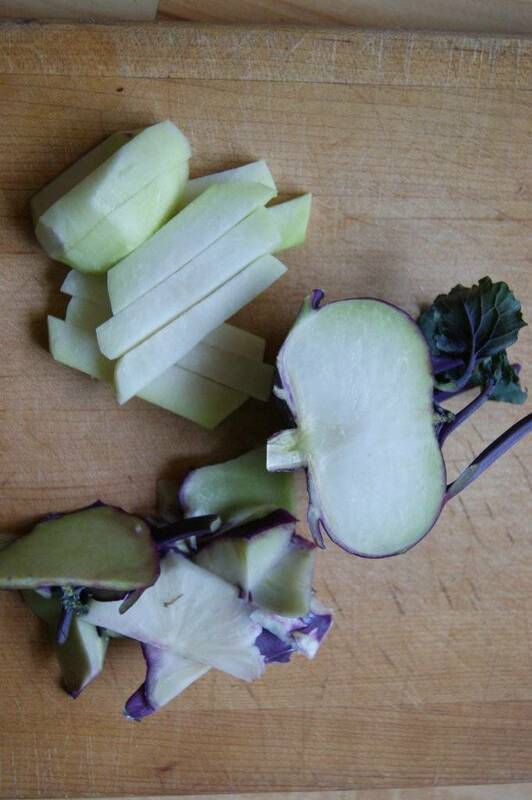 Freshly harvested kohlrabi is one of the juiciest, sweetest, crispiest of raw vegetables that I know of. It tastes they way broccoli wishes it could taste. 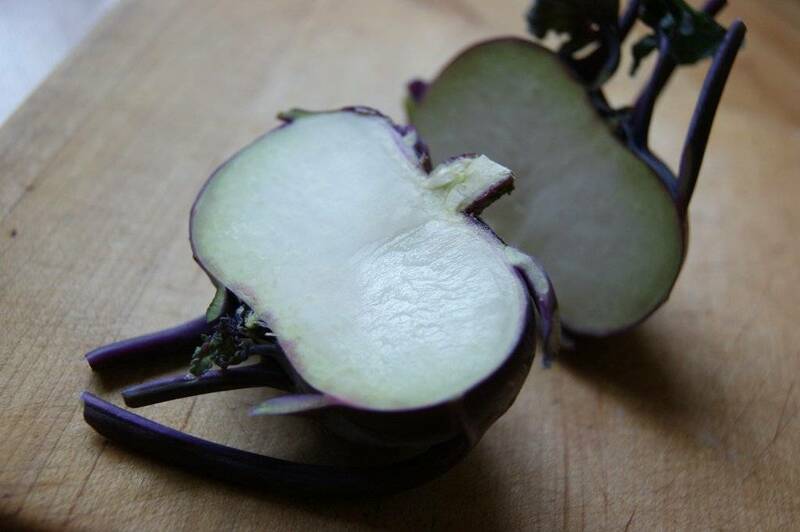 Kohlrabi can be cooked as well, but there is no point in wasting it in that fashion. Cooked kohlrabi tastes fine, but so does cooked turnip and cooked broccoli. 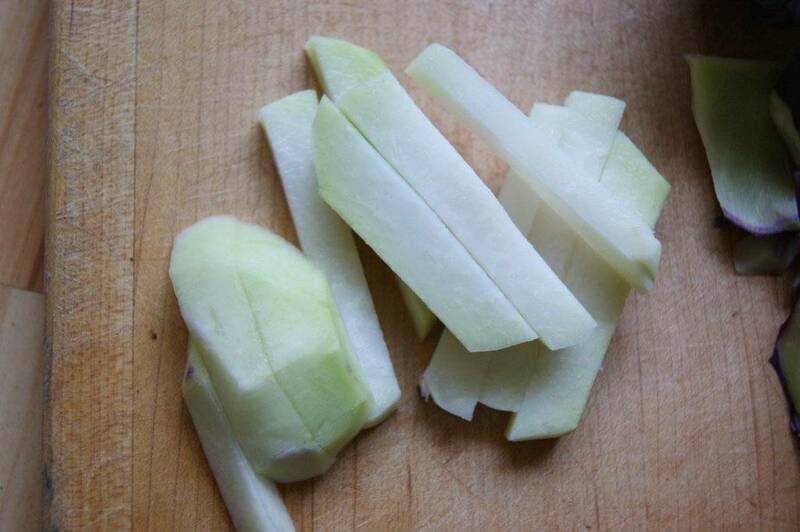 Kohlrabi stands out best as a raw vegetable. 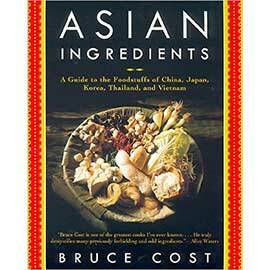 Use it as a crudite or grated into salads and slaws to enjoy it at its best. 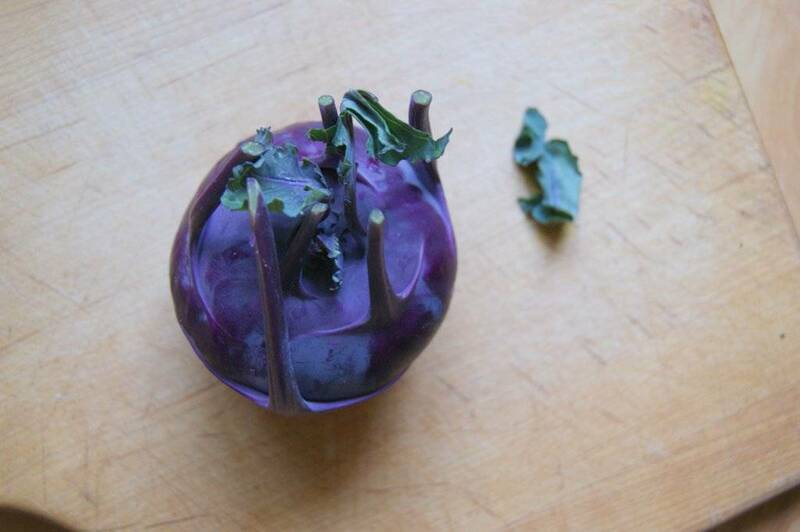 And, although kohlrabi store well, they lose much of their crisp juiciness as time goes by, so I definitely recommend making the most of the peak kohlrabi season. Buy them right after they are freshly picked, then peel, cut and put in your mouth. Or make the following delicious summer coleslaw recipe. At its best in the summer when the cabbage is sweet, crisp, and juicy. This recipe is easily doubled or tripled to feed a crowd and will last at least four days in the refrigerator, staying crisp the whole time. Combine the green cabbage, carrot and kohlrabi. Add the salt and use your hands to make sure that the salt is well and evenly mixed with the shredded vegetables. Let this mixture sit for about 20 minutes, until the vegetables start to give off some juice. Now place the salted cabbage mixture in a sieve suspended over a large bowl or pot. Place a small plate over the cabbage in the sieved and place a weight of some kind on the plate (use a large can or full water bottle). Weight the cabbage mixture like this for about 30 to 40 minutes. This is to help draw out as much of the liquid as possible so that the coleslaw will stay crisp. Once the weighting time has finished, get out another medium bowl. Use your hands to squeeze out any remaining excess liquid from the vegetables, handful by handful, and place the “dry” cabbage mixture in the new bowl. Add the parsley and green onions and set aside while making the dressing. In a small bowl, whisk together the mayo, vinegar, Dijon, honey and buttermilk. Add this mixture to the wilted cabbage mixture and stir well to combine. Let sit for five minutes before tasting to see if the coleslaw needs more salt or more sourness (add more vinegar or buttermilk if you like it more sour). 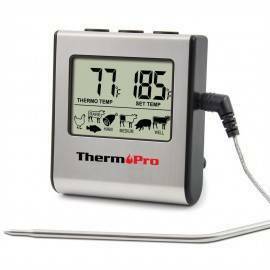 Serve immediately or refrigerate up to 4 days.